Voting has begun, see reply # 53. I'm planning to release my latest project, Draconian, at PRGE next month. 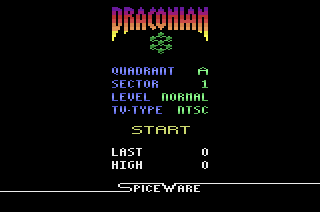 Draconian is my take on the classic arcade game Bosconian (arcade screenshots from here). 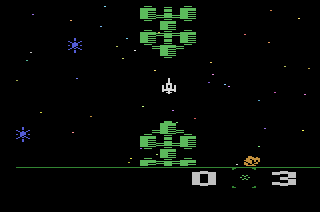 Bosconian was developed by Namco and released by Midway in the United States. Midway decided to make their own arrangement of levels, we wanted to have both so Draconian's been set up with Quadrants A, B, Γ, Δ, (alpha, beta, gamma, delta) where Alpha Quadrant is the Midway levels, Beta Quadrant is the Namco levels. 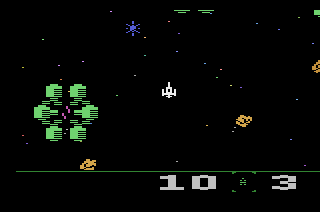 Gamma Quadrant is used as tribute to people involved with creating the game - check the radar (at the bottom between the score and lives remaining) in these screenshots. That leaves Delta Quadrant, which has been set aside for 16 user submitted sectors. Some key bits of info about the contest, after which I'll go into how to create your sectors. Allowable X and Y values are 0 to 255 to denote a position within the sector. 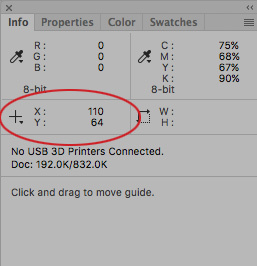 Additionally you can use -1 to -8 for the X value and -1 to -16 for the Y value. These values refer to the radar pixel locations and will be converted to the appropriate 0-255 value to light up a specific radar pixel. 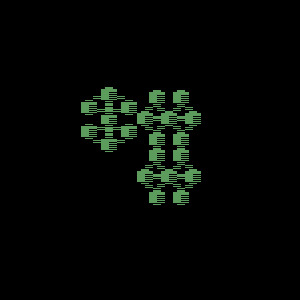 In radar pixels -1 -1 denotes the top-left corner while -8 -16 is the bottom right. 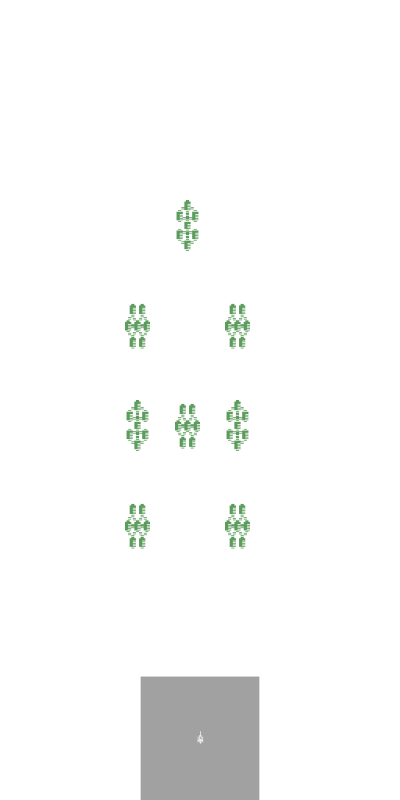 For the stations the Orientation is H for Horizontal and V for Vertical. The orientation denotes which direction the E-Type missiles will be launched from the station. Blank lines and anything following an * will be ignored. put them all in the same directory as your text file. You'll need to open up a terminal window or command prompt then run dracsec to patch draconian. added more info about game to initial post. updated ROM added to initial post. I'm loving this game Darrell, amazing job! I used to put a lot of quarters into the Bosconian arcade machine back in the day and I can't wait to see the creative levels that come out of this contest. EDIT: Done all four sectors, build attached!! Edited by cimmerian, Fri Sep 22, 2017 12:07 AM. I've been working with Darrell on Draconian, and adapted the Namco and Midway sectors, and designed some of the Gamma quadrant ones. 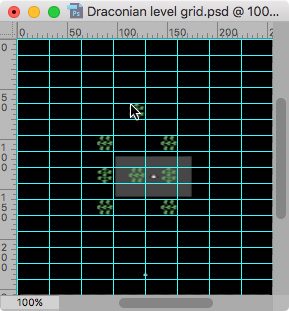 Since I'm not a programmer (at all), and thought others might want a way to visually lay out their level designs the way I did, I'm posting the Photoshop files I used to design the sectors for Draconian. 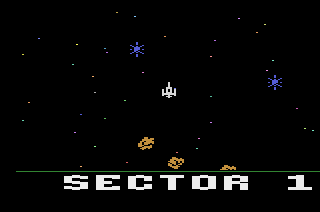 An entire sector is pretty huge - 512x1024. 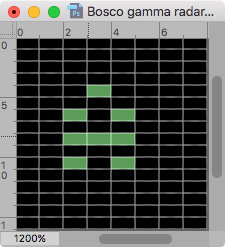 After I created a file in Photoshop, I added guidelines every 64 pixels - which corresponds with the radar grid. I also created an 8x16 file (which you have to zoom way in on), to help me visualize what the radar display would look like. 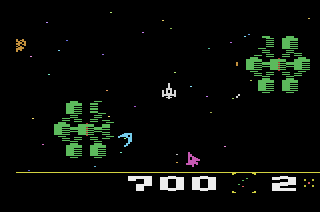 You'll notice everything looks squished - that's because the 2600's pixels aren't square. They're roughly twice as wide as they are tall. Photoshop has a nice way to compensate for this though. In its View menu, there's an option for setting Aspect Ratio Correction. I created a custom value of 2, which stretches the window out to preview the way it would appear in Stella. It doesn't change the number of pixels though, which is important. 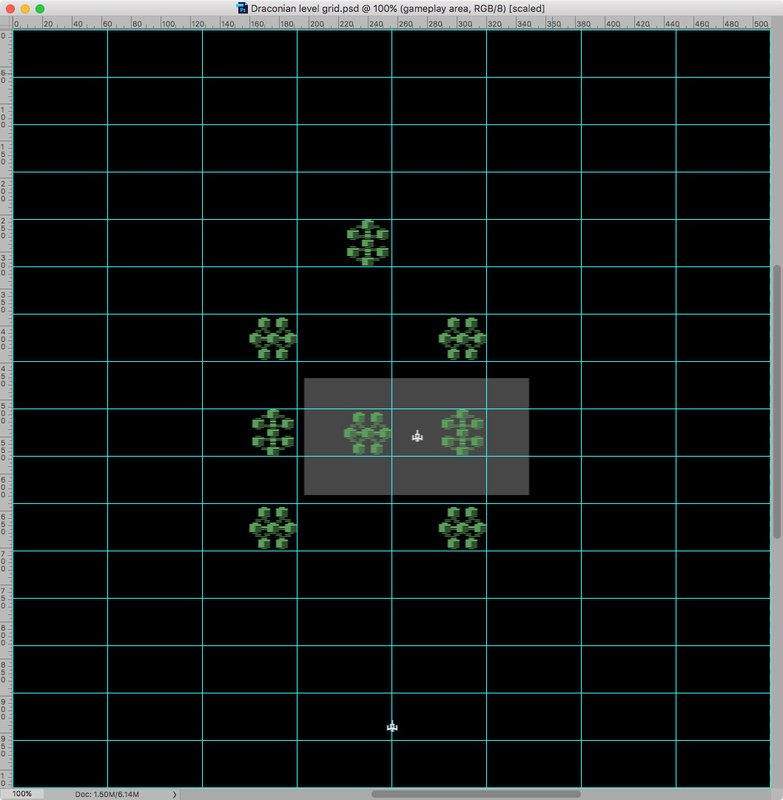 The player's ship and stations are on their own layers, so you can grab them with the marquee tool, copy and paste them, and move them around. 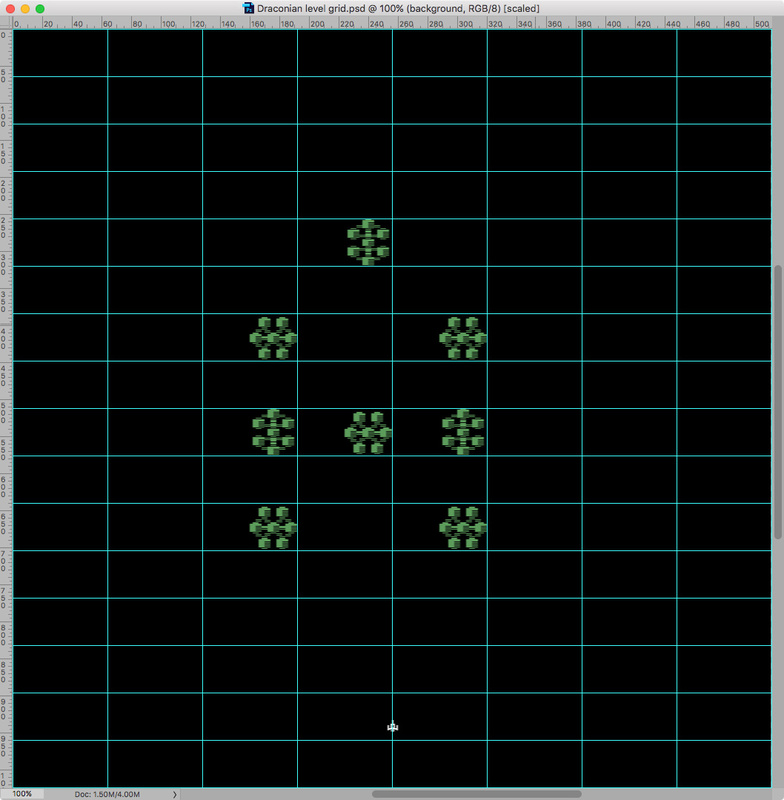 There's also a layer with a rectangle (152x158 pixels) with a ship in the center, showing the gameplay area as you would see it on screen at any given time. This helps to visualize what you would see in-game, so you can plan out where stations should be, and how crowded the screen would become. 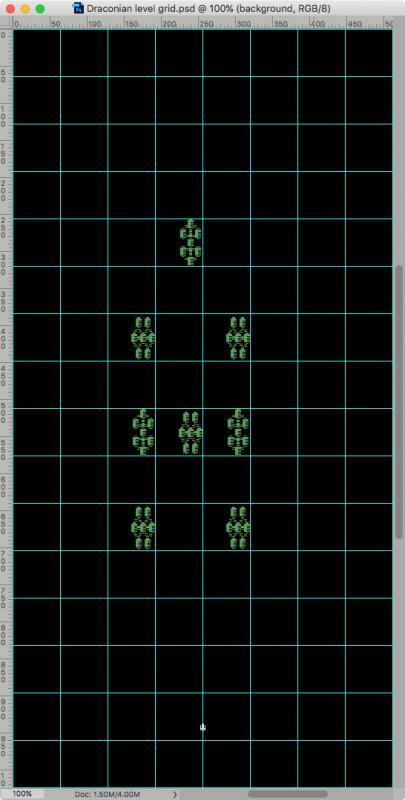 Once you have the stations laid out, you'll have to convert these to the coordinates needed for the level creator. The easiest way to do that is just resize the document to 256x256 (turning aspect ratio correction back off). Now you can move your cursor around, and use the Info panel in Photoshop to tell you where the coordinates of your space stations are. For those without Photoshop (or an application that can open its files), I've attached a transparent PNG file, which most any graphics application should be able to work with. Where do you want the player to start? Right in the middle of the action? Far away? 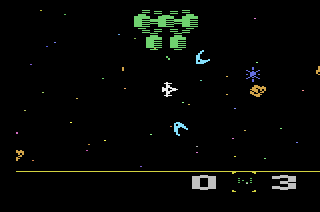 The stations don't fire at you immediately - so even if the player is surrounded by stations, there are a few seconds to take out a station or two, or get clear, before the mayhem kicks in. If the player has to fly for awhile to get to the first target, enemy ships will become more of a factor, especially in the higher levels. How do you intend the player to progress through the sector? Some of the stations in Bosconian are laid out so the player can fly in a straight line, mowing down station after station by taking out their cores. While this is fun once in awhile, it would make for a pretty boring game if all sectors were like that. If you do have stations in a line, consider how they're oriented. Mix up the direction they're facing, so if a player takes out one core, he has to fly around to the side of the next station to get a clear shot. Give the player a path to follow, but decide if it will be easy for them, or hard. Bunching up a few stations together makes it tougher to take any one of them out. They'll all start firing at you, and it will look like a virtual hailstorm of enemy fire. How the stations are oriented is important too, since the E-type missiles they fire out of their cores can take you out if two or three come at you at once. As the sectors repeat, just surviving flying from one station to another becomes challenging. So you may want to put one or two stations well away from the rest, just to make the player have to go and get them. The edges of the sector wrap-around. So if you put stations along the edge, you can take shortcuts by going off the edge of the radar screen. In the current build of Draconian, sector 3 of the Delta quadrant has the stations at the corners. It takes awhile to get to them, and it's a bit disorienting hopping from corner to corner to take them out, but it's a fun level to play. I'm looking forward to seeing what everyone comes up with. Have fun! Another ROM update in the initial post. How the sector designs are going? Any problems running dracsec? This will be available on cart at PRGE?? This game really looks amazing. Can't wait to see the box & manual. I also need people to do extra testing over the next couple of weeks, on real hardware via a Harmony Cart if at all possible, to make sure we find and fix any bugs. If you find any please post them in the Homebrew Topic. They're amazing too - I'm current staring at the 4K desktop version (and I believe Al has the 5K version on his system). I'm sure we'll make them available in the near future. A new ROM was added to the initial post. Please use this one for your entry. I just realized yesterday about this contest, and I didn't have time to create anything at all. Seems like a lot of people don't go out of their way to look at the Contests forum and some who do look will pop in just to peek at what others are doing because they know their entry wouldn't be good enough. Some people who have a slight interest won't want to download special software and read instructions when all they want to do is stare at TV or go to bed after working all day at the scratch and sniff factory. 68 downloads of the tool (30 here, 38 in the blog) and only 1 entry. Main issue is we're planning to release at PRGE, which means I need to have the release candidate ready next weekend. I'll extend the contest to Thursday at midnight, leaving Friday & Saturday for people to test the submitted levels out.